Electronic test and measurement work is increasingly required to complete with faster deployment and quick turnovers as new products are being rolled out with a shorter development cycle. Testing professionals are required to reduce the cost of testing yet still cover the ground for accurate and precise measurement for complex analysis of mixed signal measurement such as vibration, temperature, strain, pressure and other variables. Graphtec’s portable and standalone dataloggers offer flexible test system that troubleshoots the most complex scenarios where mixed variable recordings are necessary to measure inter-dependency between various signals. Easy-to-display time stamp view of the trend analysis allows up-to-the-second view of your measurement at the palm of your hand. From lab-based benchtop testing to in-production electronics testing for multichannel measurements, GL series dataloggers and data platform provides the most accurate and well-tuned noise-protected signal analysis giving you the confidence to design and to build strong and stable electronic devices. Portable configuration offers easy-to-use troubleshooting tools for using dataloggers in various test conditions. Set up your next test scenarios within seconds using condition files for your mixed signal measurement. 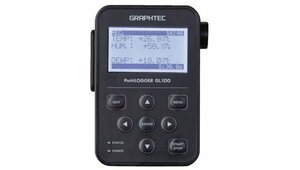 Graphtec recorders offer industry-leading handheld multichannel datalogger as the most cost-effective solution in the market. Accelerometer Amplifier (GL7-CHA) carries direct input capability for piezoelectric transducers, and is able to monitor signals from electric parts tested on shakers. GL7000's capability in recording 100 channels of temperature at 10ms (100S/s) allows dynamic recording capability for wafer furnaces. Read through roller adjustment and RPM shifts using F/V converter to the GL7000 for accurate printer performance inspection and maintenance. Apply a predetermined signal to the electronic circuit board, measure the signal voltage and temperature inside the circuit, and test the performance / functionality of the electronic circuit board. Measure the distortion applied to the electronics PCB boards when cutting the electronic circuit board and check the physical condition set by the cutting machine. Measure the control signal and acceleration of the transport mechanism in wafer manufacturing equipment and confirm the performance / capability of the transport mechanism. The XY display feature of the GL980 allows a relational display of the two signals with the ability to turn on/off trace, and change your span and position. Measure uneven rotation of paper feed roller of copy machines or printers using the GL980 in combination with an F/V converter. Measure dynamic flow rate, air volume, vibration converted into voltage signal simultaneously with temperature with high speed sampling portable datalogger. Multichannel measurement for high temp and various humidity levels help analyze root cause problems for copy machines while in transfer. Precisely measure the internal temperature along with the control signal of small household appliances. You can record the levels of vibration adherences using the proprietary vibro-meters with a direct signal output to scale and to record vibration measurement using the GL980 at dynamic sampling intervals. 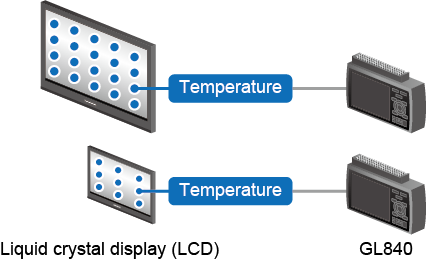 Multichannel temperature mapping of Liquid Crystal Displays (LCDs) are tested using GL840 making sure the temperature heat dispersion are the same all throughout. Monitor and Measure temperature and humidity levels inside clean rooms and analyzer how the shutdown of air conditioning system would impact the temperature levels inside the room in multiple points. Perform multi-channel measurement to investigate issues regarding internal parts and operating environment in industrial and office printers. Measure and log automotive-grade semiconductor and PCB layouts collectively inside a thermostatic environmental chambers. Manage the environment with multi-channel measurement to produce high quality products. Measure temperature and humidity levels during the drying process with a high-performance washing machines. Measure multiple channels to monitor the temperature distribution of the liquid crystal display surface during development. Monitor and record thermal and humidity data on accelerated cycle testing on automotive-grade IC in environmental chambers. 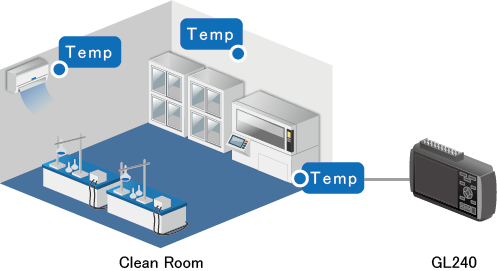 Monitoring point-by-point environmental temperature in a clean room for semiconductor equipment is critical to providing high quality manufacturing. GL840 provides in room multichannel monitoring for clean room environment. Monitor the performance of the air conditioning/HVAC units at the boot up sequences. Monitor and map temperature levels at different parts of the rooms. Measure the temperature and power consumption and confirm the energy efficiency of the refrigerator. The GL100 is used as a remote sensor for the GL840. Record the temperature inside clean rooms and monitor the temperature variances when air conditioners stop with up to 10 channels of Thermocouple measurements on the GL240. Use a thermistor in a narrow space inside smartphone main body as an example to measure temperature according to operating condition. Check measurement data on the PC using APS software included or as a CSV file.